Background: Hypertrophic cardiomyopathy (HCM), characterized by a thickened, fibrotic myocardium, remains the most common cause of sudden cardiac death in young adults. Based on animal and clinical data, we hypothesized that atorvastatin would induce left ventricular (LV) mass regression. Methods: Statin Induced Regression of Cardiomyopathy Trial (SIRCAT) was a randomized, placebo-controlled study. The primary endpoint was change in LV mass measured by cardiac magnetic resonance imaging 12 months after treatment with once-daily atorvastatin 80 mg or placebo. A key secondary endpoint was diastolic dysfunction measured echocardiographically by transmitral flow velocities. SIRCAT is registered with www.clinicaltrials.gov (NCT00317967). Results: Of 222 screened patients, 22 were randomized evenly to atorvastatin and placebo. The mean age was 47 ± 10 years, and 15 (68%) were male. All subjects completed the protocol. At baseline, LV masses were 197 ± 76 g and 205 ± 82 g in the placebo and atorvastatin groups, respectively. After 12 months treatment, the LV masses in the placebo and atorvastatin groups were 196 ± 80 versus 206 ± 92 g (P = 0.80), respectively. Echocardiographic indices were not different in the two groups at baseline. After 12 months, diastolic dysfunction as assessed using transmitral flow velocities E/E', A/A', and peak systolic mitral velocity showed no benefit from atorvastatin. Conclusions: In patients with HCM, atorvastatin did not cause LV mass regression or improvements in LV diastolic function. Hypertrophic cardiomyopathy (HCM) is a primary disorder of the heart characterized by a thickened, fibrotic myocardium with or without a dynamic left ventricular (LV) outflow tract gradient. It is a common heritable cardiovascular disease, with a population prevalence of 0.1–0.2%. Symptoms of congestive heart failure (CHF) are extremely common in patients with HCM, and patients with HCM also have a high prevalence of nonfatal arrhythmias such as supraventricular tachycardias (45%), atrial fibrillation (25–30%), and nonsustained ventricular tachycardia (26%). HCM is also the most common cause of sudden cardiac death in young adults. Progression to disabling and debilitating symptoms (New York Heart Association [NYHA] Classes III and IV) is relatively common, occurring in 15–20% of unselected populations. Symptom management can be very challenging and involve multiple medications, with 5% of patients developing drug refractory heart failure. Currently, there is no cure for this common cardiac genetic malady. HMG-CoA reductase inhibitors effectively prevent and ameliorate HCM in a transgenic rabbit model. Atorvastatin prevents the onset of hypertrophy, and simvastatin causes the regression of established hypertrophy. As well, human data suggest a similar potential benefit. Statin therapy was associated with improved survival in a retrospective study of 551 patients with ischemic and nonischemic CHF. In the Scandinavian Simvastatin Survival Study, there was 20% of reduction in heart failure with simvastatin compared to placebo. In a prospective randomized trial in patients with dilated nonischemic cardiomyopathy, simvastatin significantly improved both NYHA functional class and LV ejection fraction (LVEF). Therefore, we evaluated the effects of atorvastatin on LV hypertrophy (LVH) in a prospective randomized placebo-controlled trial in adult patients with HCM. The Statin Induced Regression of Cardiomyopathy Trial (SIRCAT) was a proof-of-concept, prospective, parallel design, single-center, randomized, placebo-controlled trial conducted at the University of Calgary, Canada, between July 2007 and December 2010. All subjects and investigators were blinded throughout the study and during data analysis. Patients were eligible for the study if they were ≥18-year-old, and had HCM based on the two-dimensional echocardiography identification of an hypertrophied, nondilated left ventricle (wall thickness with septal-to-posterior wall thickness ratio of ≥1.3:1) in the absence of another cardiac, or systemic disease capable of producing this magnitude of wall thickening. They were ineligible for the study entry if they had (1) ongoing use of statin therapy or intolerance to it, (2) hypertension, (3) a myectomy or septal ablation, (4) use of calcium channel blocker or angiotensin receptor blocker at baseline for <3 months  or had a dose change within the 3 months prior to randomization, (5) indication for statin therapy for primary or secondary prevention of coronary artery disease, or (6) current or anticipated indication in ≤1 year for implantable cardioverter-defibrillators or other metallic devices preventing cardiac magnetic resonance imaging (CMR). Patients were randomly assigned 1:1 to receive atorvastatin 80 mg once daily or placebo (both from Pfizer Canada) in a double-blind fashion for 12 months. The atorvastatin dose used was based on consistent pleiotropic effects with cardiac benefits demonstrated at a dose of 40 mg,,, with discontinuation rate and adverse events shown to be similar between 40 mg and 80 mg doses. The primary outcome was change in LV mass at 12 months as measured by CMR. Secondary outcomes include (1) improvement in myocardial relaxation velocities by echocardiography, (2) change in maximal ventricular wall cross-sectional width, and (3) change in volume of dense myocardial fibrosis (absolute, fibrotic mass, and percentage) as quantified by MRI. Follow-up visits were performed at 6 and 12 months. All images were deanonymized and assessed blindly. All CMR studies were performed using a clinical 1.5-T MRI system (Avanto ®, Siemens Healthcare, Erlangen Germany) with a 32-channel cardiac coil and retrospective electrocardiogram gating. The CMR imaging protocol included standard, end-expiratory cine imaging in sequential planes (from above the mitral valve annulus to beyond the LV apex) using a steady-state free-precession pulse sequence. Typical imaging parameters were: Slice thickness 10 mm, gap 0 mm, TE 1.12 ms, flip angle 74°, matrix 256 × 205, temporal resolution 30–67 ms, acceleration factor of 2. Gadolinium-diethylenetriamine penta-acetic acid (0.175 mmol/kg) was administered intravenously. Late gadolinium enhancement imaging (LGE) imaging was obtained with the following parameters: Phase-sensitive inversion recovery, slice thickness 10 mm, TE 3.35 ms, flip angle 25°, and TR 550 ms.
All images were de-identified and digitally stored for off-line analysis. Sequential short-axis cine image data sets were examined to determine the LV volumes and mass by semi-automated contour tracing. LGE volume was quantitated using a 5 standard deviation (SD) signal intensity cutoff above remote myocardium using cvi42 software (Circle Cardiovascular Inc., Calgary Canada). LV septal thickness, end-diastolic (ED) volume (Simpson's biplane), end-systolic volume, and ejection fraction were measured. Diastolic function ,, was assessed using early transmitral flow velocity E/E', and late transmitral flow velocity A/A', and peak systolic mitral velocity (Sa). The primary hypothesis was that atorvastatin treatment would reduce LV mass. The mean LV mass was assumed to be 220 g. In hypertensive populations, an 11% reduction in LV mass detected by echocardiography was clinically significant. Therefore, our sample size was based on achieving a 10% decrease in LV mass, that is, a conservative effect size of 20 g. Grothues et al. reported a within-patient SD of 8.4 g for two CMR measurements in a single day. We doubled the daily within-patient SD of 8.4–17.0 g to accommodate increased variability with time. Using the targeted effect size (20 g) and estimated SD (17 g), 16 completed patients would be required per group to achieve 90% power with a two-sided type I error of 5%. This was inflated to 38 recruited patients to allow for a 15% patient loss due to drop-out, noncompliance, and loss to follow-up. However, the executive Committee elected to stop the study after 22 patients had been enrolled for logistic reasons, recognizing the complete follow-up, and compliance. This provided >80% power with a two-sided type I error of 5% to detect the prespecified effect size. The sample distributions were summarized and described with means and SDs as well as median and interquartile ranges if appropriate. The significance of differences among groups was analyzed with two-way analysis of variance. Of the 222 patients screened, 200 were excluded from the study [Figure 1]. Reasons for exclusion included: 69 did not meet echocardiographic criteria for HCM, 43 were on an HMG-CoA reductase inhibitor, 29 declined participation, 26 had an implantable cardiac rhythm device, 16 were hypertensive, nine lived far away or had multiple medical co-morbidities, four had histories of substance abuse or noncompliance to medical therapy, two did not meet criteria of stable medical therapy, one was <18 years, and one had a language barrier. Of the 22 patients who were eligible for randomization, 11 patients were randomized to 80 mg atorvastatin once daily and 11 received placebo [Figure 1]. The mean age of the cohort was 46.7 ± 9 years, and 15(68%) were male [Table 1]. 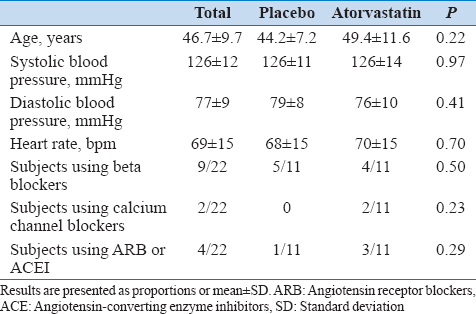 Similar proportions of patients on each of atorvastatin and placebo were on beta-blockers, calcium channel blockers, angiotensin receptor blockers, and angiotensin-converting enzyme inhibitors at baseline. There were no significant differences in the mean heart rate or systolic or diastolic blood pressure between the two groups. There was no loss to follow-up or withdrawal from the study. There were no significant adverse events, and the dose of atorvastatin was maintained at 80 mg daily in all subjects. There were no significant differences in the baseline mean LV mass assessed by cardiac magnetic resonance imaging of 197 ± 76 g in the placebo group versus 205 ± 82 g in the atorvastatin group [Table 2] and [Figure 2]. The change in LV mass was −0.28 ± 16 g in the placebo group versus 0.7 ± 17 g in the atorvastatin group (P = 0.9). Similarly, there were no significant differences in the mean LV mass at 6 and 12 months between the groups. LVEF and mean ED volumes assessed by CMR at baseline, 6 and 12 months were also not significantly different between the groups [Table 2] and [Figure 2]. LGE imaging was used to quantitate the volume of myocardial fibrosis identified within the LV myocardium. There was no significant change in the volume of LGE identified over time in either the placebo or statin-treated group as measured by cardiac MRI [Figure 2]. Interventricular septal thickness and LV end systolic and diastolic diameters assessed by echocardiography were not significantly different from baseline values at 6 and 12 months of follow-up both groups [Table 2]. Similarly, parameters of diastolic dysfunction parameters assessed by echocardiography were not significantly different from baseline during the period of the follow-up between the groups. Mean change in early (E/E') and late (A/A') transmitral flow velocities [Figure 3] from baseline to 12-month follow-up were ΔE/E' 1.6 ± 3.3 versus 0.2 ± 3.4 m/s (P = 0.47) in placebo and atorvastatin patients, respectively and ΔA/A' 1.9 ± 3.6 versus −0.3 ± 2.9 m/s (P = 0.13), in placebo and atorvastatin patients, respectively. Sa at baseline, 6 and 12 months were also not significantly different among the groups [Table 2] and [Figure 3]. 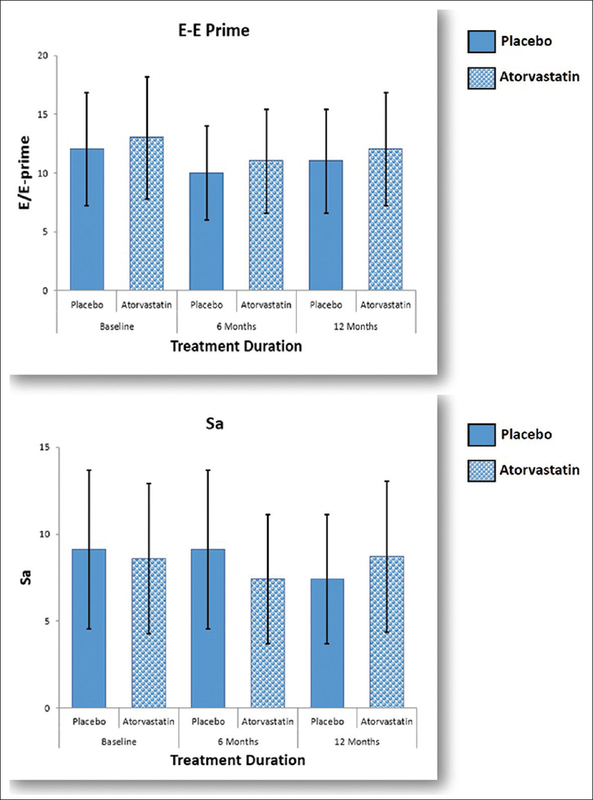 We compared the effect of atorvastatin 80 mg once daily with placebo administered in double-blinded fashion in patients with HCM. Atorvastatin did not have any effect on the primary outcome of regression in the LV mass after 12 months of follow-up. This randomized clinical trial was prompted by contemporary and compelling evidence that statins prevent and reverse HCM in rabbits, reverse hypertrophy in humans, and reduce heart failure symptoms in patients with reduced LVEFs. Simvastatin induced the regression of cardiac hypertrophy in vivo in a transgenic rabbit model of human HCM. Rabbits with β-myosin heavy chain HCM received either simvastatin or placebo. The simvastatin group had a significant reduction in LV mass, interventricular posterior wall thickness, LV filling pressure, and lower left atrial pressure. Similarly, simvastatin given to rats with LVH significantly improved LV function. Statins also prevented the development of cardiac hypertrophy in young transgenic rabbits carrying the myosin heavy chain mutation Q403 without cardiac hypertrophy at baseline. Therefore, statins both prevent the development and induce the regression of HCM in rabbits carrying a mutated gene for HCM. Analyses of several retrospective and randomized clinical trials of statins suggested that they may reduce LV mass and improve heart failure. A recent retrospective case–control study evaluated the association between treatment with statins and regression of cardiac mass in 304 patients with angina who underwent angiography. Patients treated with statins finished the study with a significantly lower LV mass index compared to the control subjects. In two randomized studies of pravastatin in hypertensive and normotensive patients, pravastatin significantly reduced LV mass., Finally, statins reduced heart failure symptoms and improved cardiac function in one large retrospective study  and two large randomized studies. These reports prompted the SIRCAT study, which was designed as a pilot, proof-of-principle assessment in the anticipation of a subsequent randomized trial with clinical outcomes. The study was negative, finding no benefit in any measure of myocardial mass, volume, or function. The close similarity between control and experimental point estimates suggests that the negative results are not due simply to inadequate power. It might be that the highly selected randomized sample in some way provided an atypical population. As well, there may be important differences between our patients with HCM and the transgenic rabbit model. Similarly, there are important differences among HCM, hypertensive heart disease, and myocardial hypertrophy that mitigated against a successful study. Since the implementation of SIRCAT two similar studies have been published. Nagueh et al. reported  the results of an open-label, uncontrolled, prospective, dose-ranging study of atorvastatin in 32 patients with HCM. Only 11 subjects completed the 12-month study, and there was no significant improvement while taking atorvastatin in brain natriuretic peptide, NYHA functional class, or any echocardiographic measure of ventricular mass, or diastolic function. Echocardiography has considerably higher interstudy variability than does cardiac magnetic resonance imaging. Bauersachs et al. reported a study  very similar to SIRCAT: A prospective, placebo-controlled study of atorvastatin, with 22 randomized patients followed for 9 months. LV mass was estimated with cardiac MRI. They too detected no significant benefit from atorvastatin. Kostner  reviewed these and earlier animal and human studies and raised the possibility that the two reports of statins and HCM may have been underpowered, or limited by drop-out. With this third negative report and second tightly controlled randomized clinical trial with negative results, the answer now seems conclusive: Atorvastatin does not cause regression of LV mass in subjects with HCM. As with earlier studies, SIRCAT was composed of a small sample size, but due to the low interstudy variability of cardiac MRI, it had adequate power to detect a clinically significant difference. As with Bauersachs et al., a very small proportion of patients who were screened was eventually randomized, and it remains possible that there was an unintended selection bias. There are several genes known to be associated with HCM, and it is possible that our subjects had genotypes that did not respond to atorvastatin. 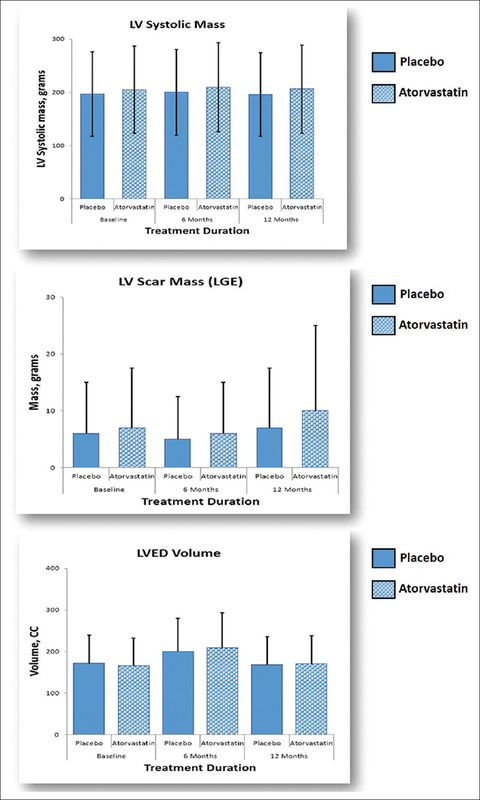 In patients with Hypertrophic cardiomyopathy (HCM), Atorvastation 80 mg once daily was not associated with LV mass regression or improvement in LV diastolic function at 12 months when compared with placebo. Supported by grants to Dr. Robert Sheldon from the Heart and Stroke Foundation of Alberta and Pfizer Canada. Senthil V, Chen SN, Tsybouleva N, Halder T, Nagueh SF, Willerson JT, et al. Prevention of cardiac hypertrophy by atorvastatin in a transgenic rabbit model of human hypertrophic cardiomyopathy. Circ Res 2005;97:285-92. Patel R, Nagueh SF, Tsybouleva N, Abdellatif M, Lutucuta S, Kopelen HA, et al. Simvastatin induces regression of cardiac hypertrophy and fibrosis and improves cardiac function in a transgenic rabbit model of human hypertrophic cardiomyopathy. Circulation 2001;104:317-24. Horwich TB, MacLellan WR, Fonarow GC. Statin therapy is associated with improved survival in ischemic and non-ischemic heart failure. J Am Coll Cardiol 2004;43:642-8. Pedersen TR, Kjekshus J, Berg K, Haghfelt T, Faergeman O, Faergeman G, et al. Randomised trial of cholesterol lowering in 4444 patients with coronary heart disease: The Scandinavian Simvastatin Survival Study (4S). 1994. Atheroscler Suppl 2004;5:81-7. Node K, Fujita M, Kitakaze M, Hori M, Liao JK. Short-term statin therapy improves cardiac function and symptoms in patients with idiopathic dilated cardiomyopathy. Circulation 2003;108:839-43. Maron BJ, Olivotto I, Spirito P, Casey SA, Bellone P, Gohman TE, et al. Epidemiology of hypertrophic cardiomyopathy-related death: Revisited in a large non-referral-based patient population. Circulation 2000;102:858-64. Lim DS, Lutucuta S, Bachireddy P, Youker K, Evans A, Entman M, et al. Angiotensin II blockade reverses myocardial fibrosis in a transgenic mouse model of human hypertrophic cardiomyopathy. Circulation 2001;103:789-91. Farmer JA. Intensive versus moderate lipid lowering with statins in acute coronary syndromes. Curr Atheroscler Rep 2005;7:85-6. Ridker PM, Cannon CP, Morrow D, Rifai N, Rose LM, McCabe CH, et al. C-reactive protein levels and outcomes after statin therapy. N Engl J Med 2005;352:20-8. Schwartz GG, Olsson AG, Ezekowitz MD, Ganz P, Oliver MF, Waters D, et al. Effects of atorvastatin on early recurrent ischemic events in acute coronary syndromes: The MIRACL study: A randomized controlled trial. JAMA 2001;285:1711-8. Ho CY, Sweitzer NK, McDonough B, Maron BJ, Casey SA, Seidman JG, et al. Assessment of diastolic function with Doppler tissue imaging to predict genotype in preclinical hypertrophic cardiomyopathy. Circulation 2002;105:2992-7. Cardim N, Oliveira AG, Castela S, Longo S, Ferreira T, Pereira A, et al. Regional myocardial function by tissue Doppler in hypertrophic cardiomyopathy: The impact of obstruction. Rev Port Cardiol 2002;21:1413-35. Cardim N, Oliveira AG, Longo S, Ferreira T, Pereira A, Reis RP, et al. Doppler tissue imaging: Regional myocardial function in hypertrophic cardiomyopathy and in athlete's heart. J Am Soc Echocardiogr 2003;16:223-32. Devlin AM, Moore NR, Ostman-Smith I. A comparison of MRI and echocardiography in hypertrophic cardiomyopathy. Br J Radiol 1999;72:258-64. Devereux RB, Wachtell K, Gerdts E, Boman K, Nieminen MS, Papademetriou V, et al. Prognostic significance of left ventricular mass change during treatment of hypertension. JAMA 2004;292:2350-6. Grothues F, Smith GC, Moon JC, Bellenger NG, Collins P, Klein HU, et al. Comparison of interstudy reproducibility of cardiovascular magnetic resonance with two-dimensional echocardiography in normal subjects and in patients with heart failure or left ventricular hypertrophy. Am J Cardiol 2002;90:29-34. Chen MS, Xu FP, Wang YZ, Zhang GP, Yi Q, Zhang HQ, et al. Statins initiated after hypertrophy inhibit oxidative stress and prevent heart failure in rats with aortic stenosis. J Mol Cell Cardiol 2004;37:889-96. Nishikawa H, Miura S, Zhang B, Shimomura H, Arai H, Tsuchiya Y, et al. Statins induce the regression of left ventricular mass in patients with angina. Circ J 2004;68:121-5. Su SF, Hsiao CL, Chu CW, Lee BC, Lee TM. Effects of pravastatin on left ventricular mass in patients with hyperlipidemia and essential hypertension. Am J Cardiol 2000;86:514-8. Lee TM, Chou TF, Tsai CH. Association of pravastatin and left ventricular mass in hypercholesterolemic patients: Role of 8-iso-prostaglandin f2alpha formation. J Cardiovasc Pharmacol 2002;40:868-74. Nagueh SF, Lombardi R, Tan Y, Wang J, Willerson JT, Marian AJ. 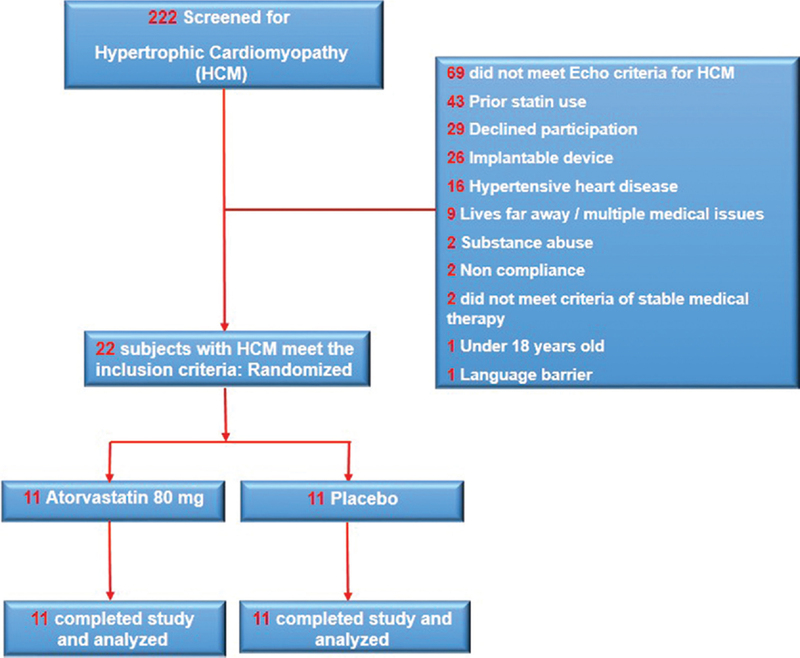 Atorvastatin and cardiac hypertrophy and function in hypertrophic cardiomyopathy: A pilot study. Eur J Clin Invest 2010;40:976-83. Bauersachs J, Störk S, Kung M, Waller C, Fidler F, Hoyer C, et al. HMG CoA reductase inhibition and left ventricular mass in hypertrophic cardiomyopathy: A randomized placebo-controlled pilot study. Eur J Clin Invest 2007;37:852-9. Kostner KM. Statin therapy for hypertrophic cardiomyopathy: Too good to be true? Eur J Clin Invest 2010;40:965-7.